Magali Duzant’s interdisciplinary work fuses the poetics of perception with a scientific approach to relating the lived experience. In her installation, Duzant illuminates the power of gesture to serve as a universal language. The text, an American Sign Language translation of an excerpt from Walt Whitman’s poem “Crossing Brooklyn Ferry,” underscores the possibility of human connection through shared experience. To translate the poem, Duzant created an archive of hands using different hands for each letter, many of them local artists who were first time signers. As a result, each hand forms a different version of the letter it portrays, personalizing the interpretations of the universal gestures. Magali Duzant’s work has been shown at SPRING/BREAK Art Fair, 3W Group, and Fridman Gallery, all in NY; Queens Museum, Local Project, and Flux Factory, all in Queens; Pelham Arts Center; and Gospel Flat, Bolinas, CA. Internationally, she has been featured at Crypt Gallery, London; The State Hermitage Museum, St. Petersburg; and Parramatta Artist Studios, Sydney. She earned her MFA in Photography from Parsons School for Design and her BHA in Fine Art & Visual Culture from Carnegie Mellon University, Pittsburgh, PA. 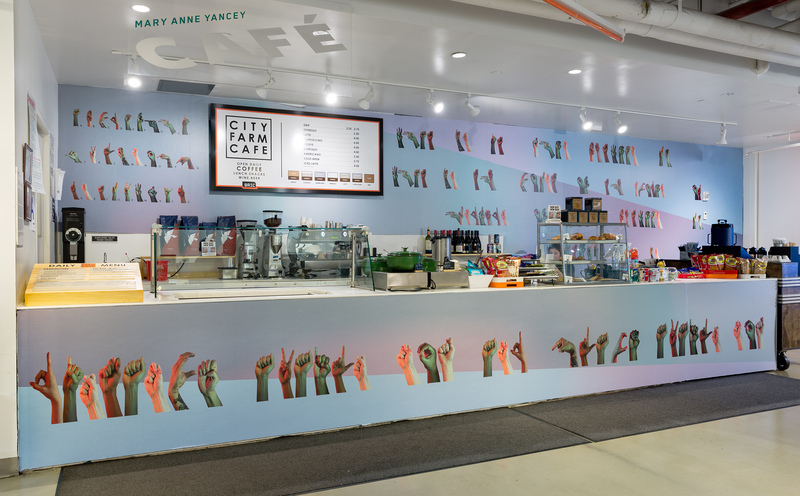 The café features a rotation of large-scale commissioned murals that envelop the first floor café space.